Note: Since the publication of the article, I have been made aware of reactions from DepEd. Although DepEd order no. 31 s.2012 failed to mention trigonometry in enclosure 1, page 3, trigonometry is indeed part of the spiral curriculum for Mathematics in Grade 10 (the old fourth year high school) - as described in a draft of the curriculum made in January. In this draft, the first three years of high school (Grades 7-9) will cover algebra, geometry, and statistics and probability every year in a spiral fashion. This is good news. The bad news is that the article below is not so much about not having trigonometry. The article begins with a reaction (which seems happy) of a teacher after finding out that trigonometry is not part of the curriculum, but the rest talks about why science must be taught in early childhood. DepEd may have missed the science education part which is the central topic of the article but what is more disconcerting is that DepEd missed a deeper side of the article, one which begins with a teacher's statement, and how the Philippine society really views science and scientists. "All subjects will be taught in a spiral approach. Science will have biology, chemistry, physics and earth sciences per year [1 quarter each] from Grade 3-10. The math curriculum also features a strengthened statistics component. Based form [sic] the DO, there is no trigonometry component in K-10. I think that this is a good move by DepEd since Statistics is easier and is needed by majority of the students than Trigonometry which is needed only by STEM (sci, tech, engg, math) students." Science will not be taught as a formal subject in Kindergarten up to Grade II. Although this has been the practice since the education reform at the beginning of this century, this continued omission in the new K to 12 curriculum should have been revisited and reexamined to see if this was really beneficial to the education of Filipino children. There are indeed other countries that do not have science as a formal subject in the early years of education. However, one must carefully consider how science is viewed in general by the society. The Philippines is one country that is enslaved by superstitions and pre-enlightenment religion. In 2006, a meeting was held between leading Philippine scientists, the Department of Science and Technology, and members of the House Committee on Science and Technology. In that meeting, one congressman related the story of how a relative was trying to find a cure for cancer. According to the congressman, even scientists at the National Institutes of Health in the US had given up, but it turned out that the cure for cancer was drinking one's urine early in the morning. Apparently, according to that congressman, the urine that built up during one's sleep contained the remedy for cancer. And there was no response from any of the attendees of that meeting. Young children are exposed to this paradigm that is simply void of reason. Postponing the introduction of science in early childhood education simply reinforces what young children are learning from their homes and in the streets, a world where biases and preconceived notions rule, an environment that does not nurture queries and investigations. Considering where the students are should have been a great reason to reinstate science as a formal subject in the early years of Philippine education. There are additional compelling reasons on why science should be taught in the early years. "Should Science Be Taught in Early Childhood?" by Eschach and Fried provides strong arguments supporting the introduction of science to young children (http://www.jstor.org/stable/40188693, Journal of Science Education and Technology , Vol. 14, No. 3 (Sep., 2005), pp. 315-336). Children are naturally inquisitive. These young minds are ripe for enjoying, observing and thinking about nature. Within a society where adults only have bad memories regarding taking high school chemistry or physics (or trigonometry), exposing the young children to the wonder of science may help in fostering a positive attitude. The early introduction to nature helps in better understanding of scientific concepts in later years of education. Science, as opposed to literature, talks directly. Early introduction to scientifically informed language is key to mastery of scientific concepts. Children can reason. Their favorite question is "why?" And since science is unique both as a discipline and as an approach, only a formal subject of science can help develop scientific thinking. The early years offer a great window. Nash, Shore and others have shown from brain research that the brain develops (neurons and their interconnections) very fast in childhood and almost stops at age 10 (grade IV) (Nash, J.M. (1997) Fertile Minds, Time 3:49-56; Shore R. (1997) Rethinking the Brain: New Insights into Early Development, Families and Work Institute, New York). "The above figure shows the changing rates of global brain glucose metabolism from newborn to adulthood. Peak glucose metabolism occurs around 4 years and begins to decline around 9 years. These changes in glucose metabolic rates are linked to the formation of neuronal connections- axons and synapses in the human brain." (Figure and caption, courtesy of Prof. Onofre de Jesus, University of Wisconsin) Therefore, as early as 4 years of age, it is suggested that children can indeed be provided input for learning. One important issue in teaching science as a formal subject in kindergarten to Grade II comes from the fact that this is how society demonstrates its view of science and scientists. What society teaches in the early grades is what society wishes to advertise to its youngest members. The development of students’ interest in science also appears to have a real influence on their career decisions later in life. In 2006, a study appearing in Science offered evidence suggesting that students who reported an interest in science-related careers in eighth grade were two to three times more likely to graduate with a baccalaureate in a science discipline than their peers who were interested in nonscience careers. This study also showed that standardized test performance was related to earning degrees in the physical sciences, but was not significant in determining who earned degrees in the life sciences. In the end, it appears that what we do as teachers to promote interest in science, may have far-reaching influence in our students’ lives. Thank you very much, Dean. I hope you would read the other five articles. And combine this with not having science in the early years, I am not sure what type of students DepEd would like to raise. 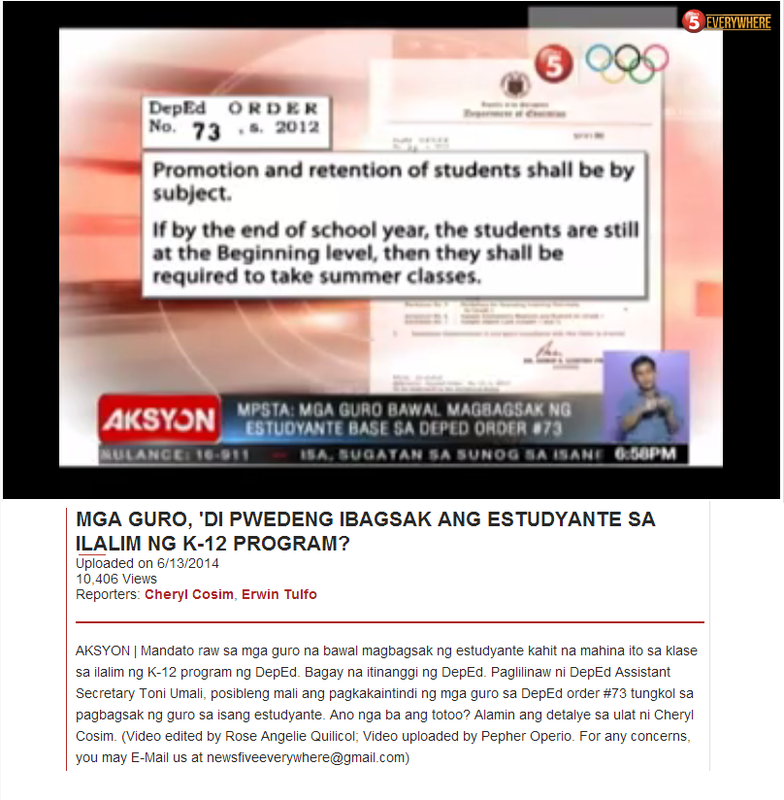 I added a note on top of the article after seeing your conversation with DepEd. Dr. Angel, I do not speak for the entire Department, and my reactions/tweets do not constitute the official stand of DepEd. That said, I merely responded to Dean's tweets that we removed Trigonometry from the high school curriculum. The K to 12 curriculum guides -- documents which Dean have copies of too (we've distributed them to schools, education NGOs, and book publishers, and plan to make them entirely public soon) -- clearly show that Trigonometry remains to be in the curriculum and taught in Grade 9 in particular. Also, we (DepEd in general, the K to 12 [multi-stakeholder] Task Force in particular) are well-aware of the debate on when Science as a formal learning area should begin. We had those debates too in the crafting of the K to 12 curriculum. Note that the final Science curriculum is largely a product of researches/findings/recommendations of UP NISMED; their former director, Dr. Merle Tan, is the Learning Area Convenor for K to 12 Science. We also have copies of the pieces you forwarded to Dr. Queena and we will be giving our reply very soon. Allow me to say this (and I'm certain you've heard/read it before): while Science as a formal learning area only begins in Grade 3, science concepts/skills are taught as early as Kindergarten. The Grade 1 curriculum, in particular, teaches science by way of the health topics: the body, nutrition, environment. Concepts are likewise integrated in other learning areas like Languages, Math, even Araling Panlipunan. A personal note: I attended a private elementary school in the 90s and even we only had Science as a formal learning area beginning in Grade 3. Modesty aside, I did very well in higher education: electronics engineer by education/qualification (top of my class and board exam), ~5 years in telco industry doing business development & product management (was one of the youngest department heads in the company), masters in public policy & management from Carnegie Mellon (top of my class too). Science performance is clearly a multivariate problem and when it is first taught as a separate subject may or may not be a critical driver of learning outcomes. I don't think the verdict is in on it yet. Again, as you probably already know too: Singapore and Malaysia teach Science as a separate subject in Grade 3 and 4, respectively. And they do well. Hope we can at least agree that it is more complicated than just pinning the blame on Science not being a separate learning area from Kindergarten to Grade 2 for all our science/math woes. I look forward to responses from DepEd, but I do hope that my articles are read thoroughly. As you could see in the article I wrote above, I was not really talking much about learning outcomes, but more on how society perceives science and scientists. Science education at the early years must also take into account the other inputs that young children see and hear. And as you correctly noted, there are various factors involved. Some children will indeed succeed and even become scientists or engineers without early science education if given an environment outside school that nurtures science. Without a good environment, however, a good introduction to science in school becomes critical in the early years. Yes, we agree that inputs/environment incredibly crucial. Do refer to www.gov.ph/k-12 for more information about the program, including how the Department is addressing gaps in critical inputs. Also, please don't link to the draft curriculum guides published on the LESSM page (I've asked them to remove those documents; they only mislead/misinform). Those files are outdated and had not gone through review of the Learning Area Convenors/Teams (teams composed of external experts/writers and internal curriculum writers), which began in September last year. Whoever shared those documents to LESSM were not authorized to do so in fact. If you could point me to studies that had been published in a peer-reviewed journal, that provided the basis of DepEd K-12, that would be helpful. As I have searched and searched, but there is none out there that describes the data and analysis required to justify this immensely expensive program of DepEd. Hi Sir Angel. Actually I was the one who posted the comment in eduphil.org. That was before I get hold of a copy of the K-12 Math curriculum guide. Anyways, I have another comment regarding the science curriculum I downloaded from LESSM (I don't know if that file is the most recent one). Luging-lugi po ang Chemistry. The chemistry part only covers 1)Classification of matter, 2) Manifestations of chemical change, 3) Solutions - discussing colligative properties without introduction to the mole concept 4) The Atom and sub-atomic particles and 5) Periodic Trends and 6)Chemical Reactions. Wala man lang 1)naming of compounds, 2)writing and balancing chemical equations 3)basic stoichiometry 4)chemical bonding 5)KMT and gases etc. The file on LESSM is apparently a draft so I could not really comment on that. The spiral curriculum will be difficult for chemistry - I am not sure how students could master chemistry in this fashion. Having only a quarter each year for chemistry means cutting chemistry into small pieces and what will happen is that each year will just go into a vicious circle. 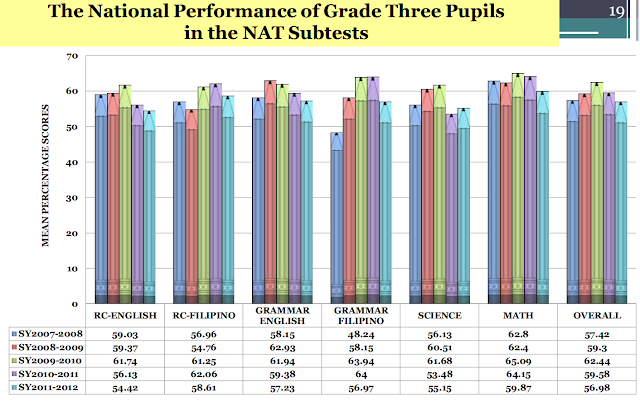 The "ladderized" part, which DepEd claims, is more of an ideal. The reality is that each year becomes remedial. Very knowledgeable and descriptive blog.Trignometry is my favorite topic.I like angles related problem.Trignometry is one of the most important part of mathematics.It is also most interesting one.